You know all that jazz about how joyous and golden childhood is and how nothing will ever be as pure and wonderful again? It’s probably true. I’ll spare you the stories (Leo jumps for joy! He hums with pleasure as he eats! He rolls on the floor laughing for sheer delight! He purrs and yowls when I get out the can opener…oh no, wait, that wasn’t him). What I want to focus on here is ice cream. Creamy. Sweet. Cold. Comforting. Refreshing. You know, ice cream. We live in a neighborhood under siege by ice cream trucks, which our son gleefully refers to as…ice cream trucks! Except, without the merciless whining and demanding that will come along with that soon. They may as well be lullaby trucks for all he knows, except, somehow, other kids walk away from them eating ice cream pops, and Leo simply looks on. I like two year olds. I really do. Being so innocent encourages them to be real learners. “Here,” I tell Leo, setting a dish of vanilla ice cream in front of him, “this is a very cold, sweet treat.” “A tweet,” he says nodding with interest as he grabs the whole scoop in his fist. 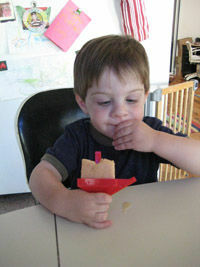 “Cowd!” As Leo learns how to eat ice cream, scooping slowly around the melty sides with his spoon, I watch vicariously. This diet is all very well, but ice cream? The thing is, Leo likes fruit probably as much as ice cream at this point. Nothing makes him feel more indulged than when he gets his hands on a piece of ripe melon. Now, before he learns to truly understand—and I learn to dread—the sound of an ice cream truck, is a perfect time for us to share healthy snacks. 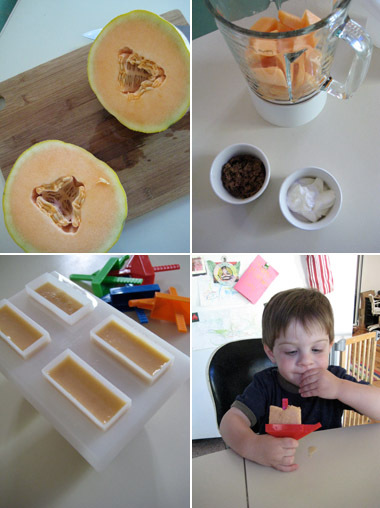 Innocent child, sugar-fiending mom, have a cantaloupe creamsicle.